Peas are one of the oldest cultivated vegetables. A team of archaeologists unearthed peas that dated to 9750 B.C. at Spirit Cave in Thailand. In ancient times, these legumes were generally dried and used in soups. In wasn’t until the 17th century that eating fresh peas became fashionable with the French people. 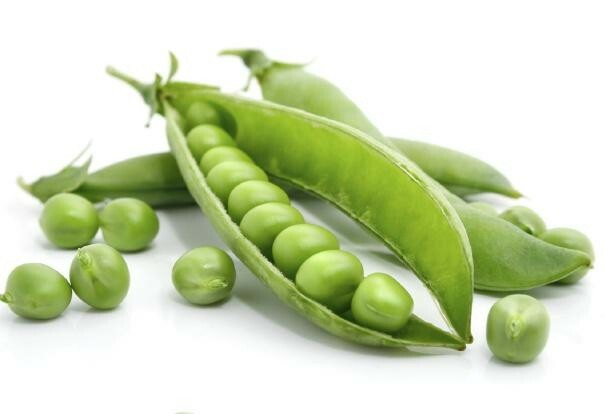 Today, we have shell or English peas (picked immature and eaten without the pod), snow or sugar peas (immature peas eaten with pod) snap peas (more mature peas eaten with the pod). Easy to grow with its graceful vines and delicate white blossoms, peas belong in every garden. A staked row of peas occupies little garden space and yields heavy. These nitrogen-fixing legumes need less fertilizing than other crops and can even help to improve the garden soil. Peas are cool-season vegetables that are well worth growing. Plant plenty- you can never have too many of these deliciously sweet and tender treasures! Plant peas near mint to improve flavour and growth. Beans, celery, corn, cucumber, eggplant, peppers, spinach, and strawberries are also superb companions. Do not plant peas near onions or garlic; they will stunt their growth. Peas are an excellent source of fiber and are good source of iron and potassium and a fair source of vitamins C and A. A ¼-pound serving of edible-pod peas has 60 calories and green or shell peas has 95 calories. 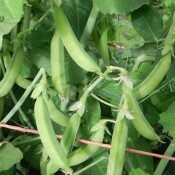 Once pods begin to form, check the plants frequently so the pea pod don’t become overgrown. The pod should be thin and the surface of the pod should feel firm but not hard. When you are picking pods, hold onto the vine with one hand and pinch off the pod with the other. Avoid damaging the vines as they are fragile. Keep pods picked to stimulate continuous production. Peas should be eaten as soon as they are picked because they are at their sweetest. Refrigerate unwashed peas in a plastic bag for up to 3 days. To prepare batches of snap peas for freezing, blanch pods for 2 minutes in boiling water. Then chill the peas rapidly in cold water and freeze.